C141HEAVEN - All there is to know, and lots more, about the Lockheed C141 Starlifter! C-141 Heaven:Out of the Way Swine! Out of the Way Swine! 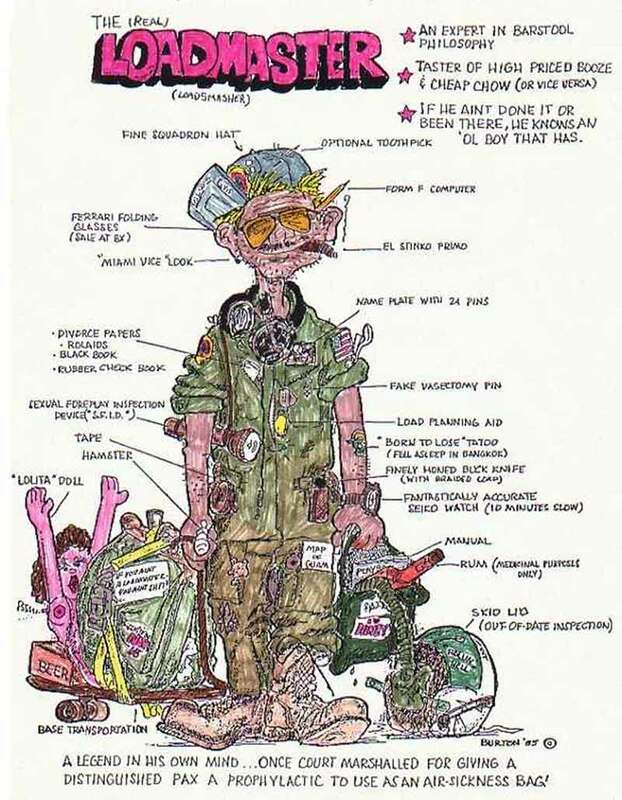 This cartoon was submitted Don Youngblood with the comment that it had circulated in the mid 1980's at the 707th MAS at Charleston. Before posting his copy I did a little tweaking with Photoshop to colorize it. C-141 Heaven received these pictures within a day or two of each other. 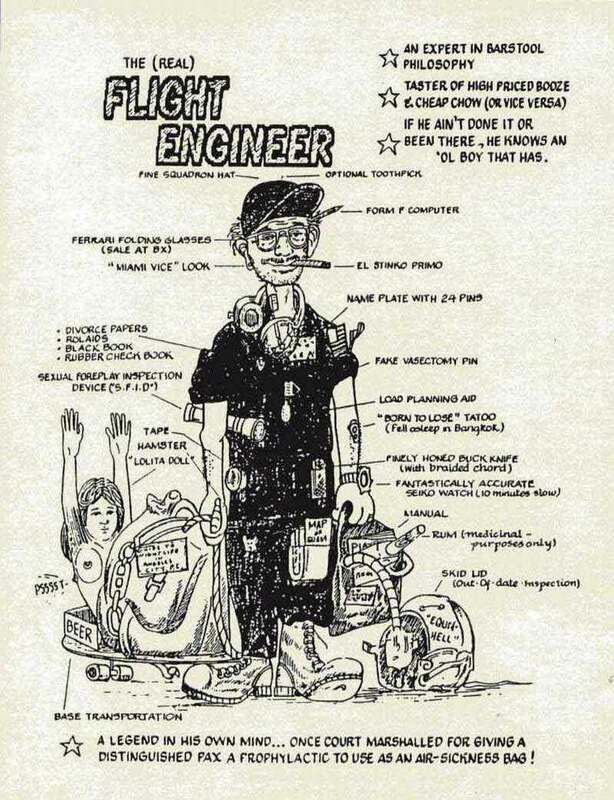 The first one was the 'Real Flight Engineer'. If you look closely at the notation about the pencil in his left ear it says "Form-F" computer, and by his left arm there's a notation about a "load planning aid". And, frankly, he's too thin to be an engineer. There are a couple of variations that have been submitted. All are shown below. This leads me to believe that this was simply re-titled to read The REAL FLIGHT ENGINEER. 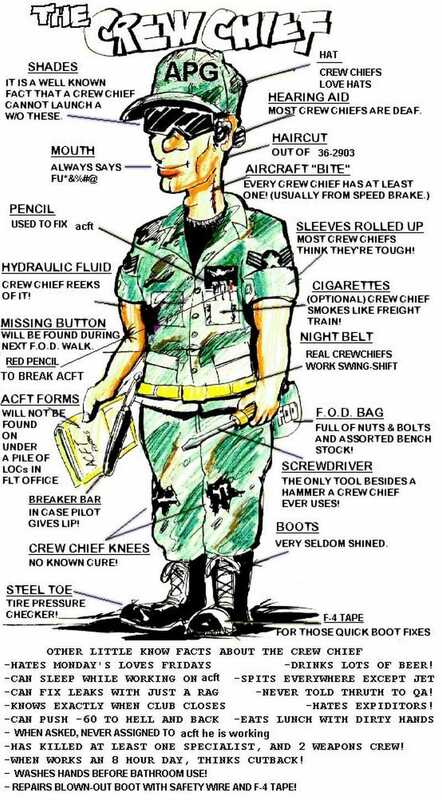 Check out the one further down the page for what was probably the original: the REAL LOADMASTER. Then came the REAL PILOT. 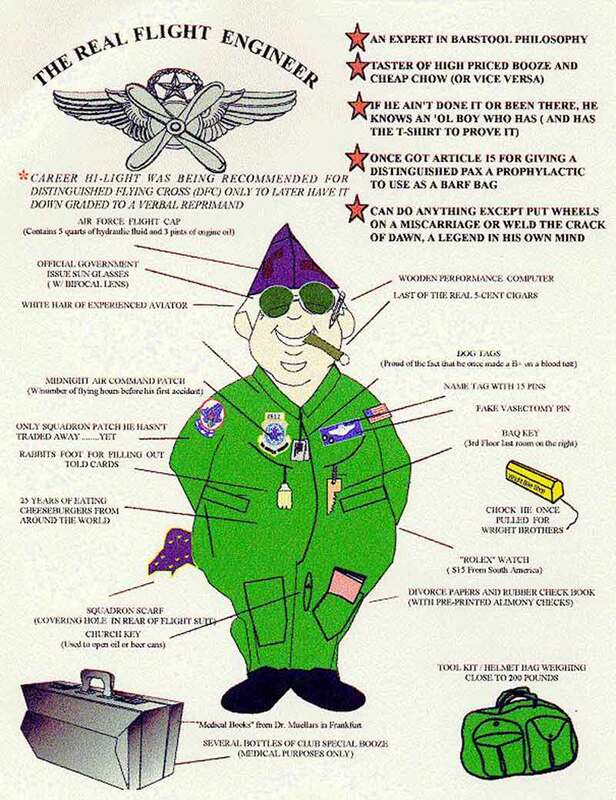 None seems to be C-141 specific, except for the blow up doll, which only C-141 crewmembers would ever think of carrying along (for emergency use as a liferaft if you had to ditch on a long overwater flight). I used to be stationed with a C-141 FE who was an artist. 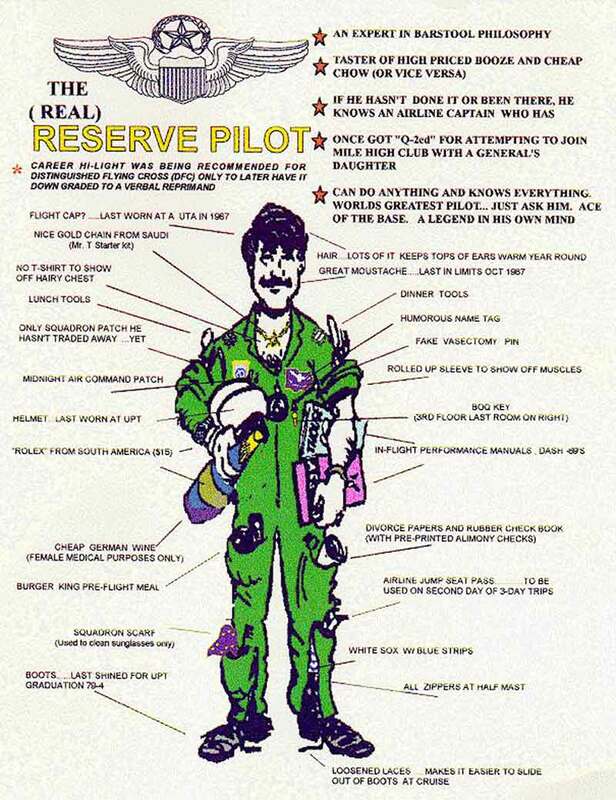 I still remember he had drawn caricatures of the crewmembers and maintainers (Pilot, Copilot, Navigator, Flight Engineer, Loadmaster, and Maintainer) for the C-141. I never managed to get copies of them but I found this for sale one day and it was close. Here's a real Flight Engineer. Later, I got this clone from someone else (sorry, I lost track of who). Looking at the "Real Engineer" cartoon brought back some memories...like, "Where have I seen that before?" 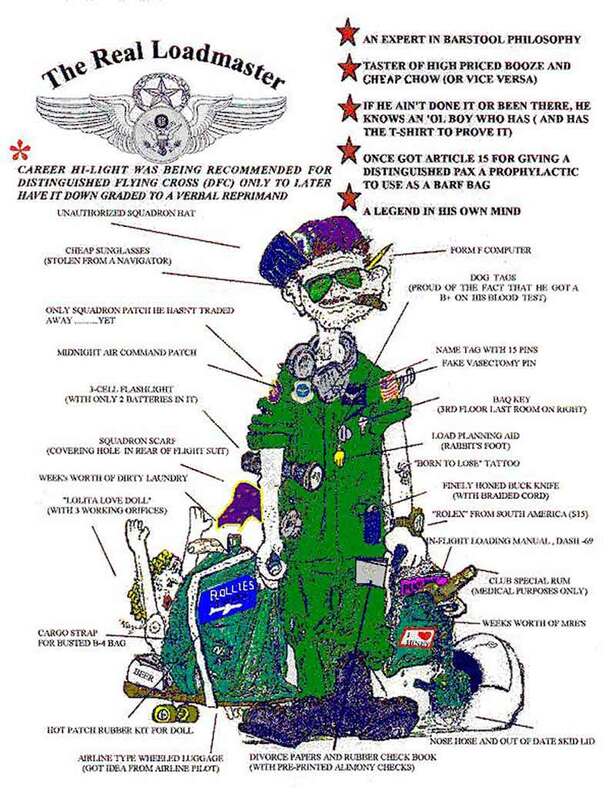 Attached is a copy of the "Real Loadmaster" cartoon that was given to me by a friend a long time ago. I wonder which came first? I am CMSgt Keith Burton and the originator of the "Real Loadmaster" as revealed by my signature (circa 1985) at the bottom of the page. I have the original and it is copyrighted. I was a 141 Load and have done other work like "I'd fly 10,000 miles to smoke a camel" of Desert Shield/Storm vintage (that was originally designed for the Aardvarks that bombed Kadahfy's house and revived during the first days of Desert Shield). All have been copied so many times that I long ago quit caring who uses them, just like seeing people enjoy them after all this time. If you are interested, I can give you the details about the Hamster on the original to validate my claim. You can contact me at keithb158@aol.com, or hollis.burton@msjack.ang.af.mil. I look forward to any inquiry. I'm currently teaching load-planning and equipment prep with the McGuire CRW (the old AMOG), and will going to the boneyard myself in December after having started my career in 1968 via Viet Nam. One of my Marine students recently brought me a copy of TRL not knowing that I did the original. It was gratifying to see the new generation appreciating fine art! (Ha Ha) Thanks and send me some mail. And another clone (again, I've lost track of the source). And of course, there's a pilot thrown in for good measure. And a crew chief, too. Submitted by Bill Verno.